Raymond et al. 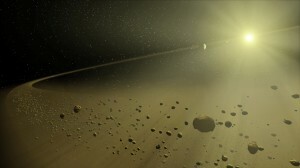 argue that debris disks like this artist's rendition may be strong indicators of terrestrial planet formation. Image copyright T. Pyle/NASA. Many astronomers are curious about the relationship between giant planets, terrestrial planets, and debris disks (circumstellar disks composed of planetesimals and dust). Specifically, astronomers would like to know whether the presence of a debris disk or a giant planet can be used to infer the presence of terrestrial planets in the same system. A Lego set of planetary embryos and planetesimals between 0.5 to 4 AU that can collide together to form terrestrial planets. The building blocks (9 Earth masses in total) have low inclinations and nearly circular orbits. Three gas giants at roughly the same distance as Jupiter and Saturn. Depending on the type of model, all three planet masses are set to a single value or the mass of each planet is drawn from the observed distribution of gas giant exoplanet masses. An outer disk of planetesimals. In most cases, the disk is 10AU wide and contains 50 Earth masses worth of planetesimals. After constructing the system, Raymond et al. start the clock and allow the system to evolve for 100-200 million years. The particle trajectories are determined using the Mercury code and particles are removed when they collide with each other, get too close to the star, or escape the system. The figure below shows the evolution of a model run in which the three giant planets had masses of 0.96, 0.46, and 0.64 Jupiter masses. The top panel shows the system configuration at 0.01 million years. The terrestrial planet building blocks are neatly confined inside the orbits of the three giant planets and the outer disk lies beyond the outermost planet. Moving vertically down the figure, each panel displays the system configuration at a later time step. Everything is pretty calm for the first 42.8 million years, but then the middle and outer giant planets pass very close to each other and cause a cascade of planet-planet scattering events. Check out the movie version of the figure for an even more dramatic view of the scattering events. By the time 500,000 years have passed, all of the inner planetesimals and over 80% of the outer planetesimals have been destroyed. The middle planet has also been ejected from the system and the inner and outer planets have swapped places. This is a rather extreme example, but this model serves well to illustrate the point that interactions between giant planets can have a dramatic effect on an entire planetary system. 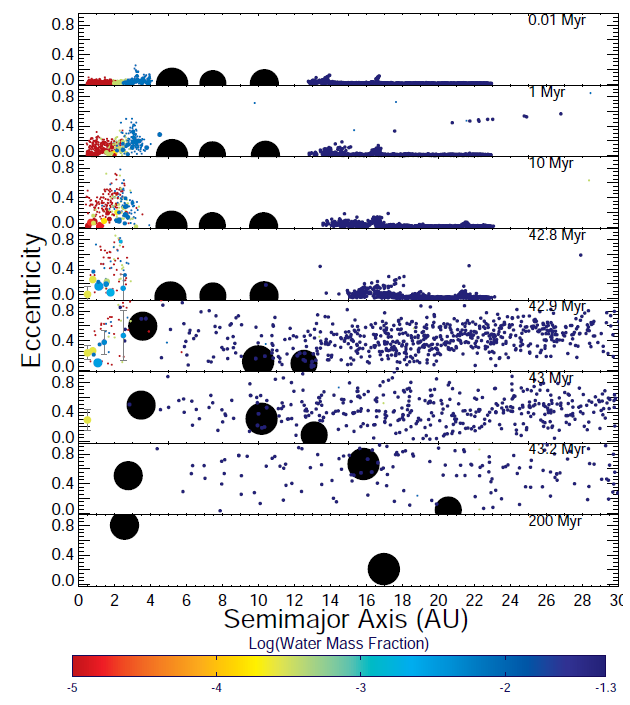 Snapshots of the eccentricity and semimajor axis of planetesimals and giant planets in a system with three giant planets with masses of 0.96, 0.46, and 0.64 Jupiter masses. The color coding indicates the water content of the planetesimals as shown in the legend. As described in the paragraph below, a close encounter between the middle and outer planets after 42.8 million years causes nearly all of the planetesimals to be destroyed and leads to the ejection of the middle planet. Figure 1 from Raymond et al. 2012. The system described above is only a single realization of one of the six different classes of models considered by Raymond et al. They vary the initial giant planet masses, outer disk properties, and disk gas content in order to study how changes in the initial conditions alter the evolution of the system. Raymond et al. find that the maximum disruption typically results when all three planets have the same mass, and that stars with more massive and extended outer disks are more likely to harbor terrestrial planets because the planetesimals in the disk can damp the eccentricities of giant planets and reduce the probability that terrestrial planets will be scattered into the star or out of the system. The authors also found that systems with low-mass giant planets are more likely to support terrestrial planets and debris disks than systems with more massive giant planets. As the title of the paper suggests, their primary conclusion is that debris disks are excellent signposts for terrestrial planet formation and the paper ends by advising astronomers to look at solar-type stars with debris disks and no giant planets for the best chance of finding terrestrial planets.